Is BJP aiming for an economically developed yet socially regressive India? An uncouth hate monger and venom spewer is the Union Culture Minister of India. A regressive man who basks in the glory of the alleged golden age of the nation is the Home minister. The less said the better about other illustrious ministers including the Minister for Foreign Affairs, HRD etc. The government at helm instigates communal riots for electoral gains and the stalwart foot soldiers and conduits are generously rewarded by the orchestrators. After the Gujarat 2002 pogrom, Maya Kodnani was sworn in as a state cabinet minister in Gujarat by none other than the pious man Narendra Modi himself. 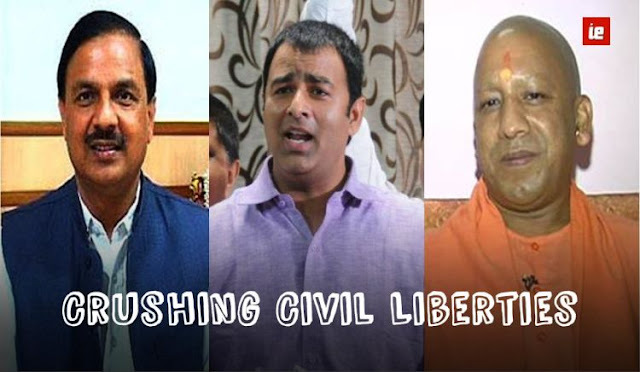 BJP MLA Sangeet Som was amongst those incited the communal riots in Muzzafarnagar which lead to a phenomenal victory for BJP in the state Assembly elections. After the lynching of an innocent man in Dadri, this legislator has blathered that " We are capable of repeating Muzaffarnagar 2.0 " and none of the gibberish uttering motormouths who are the senior party leaders have condemned him for such flagrant remarks. Free thinkers, rationalists and men of reason are brutally murdered in broad day light by hindutava fascist organizations who are ideological proteges of sangh parivar and its affiliates. Obnoxious diktats are passed which pronounce what a woman should wear and what she shouldn't, what is within the limits of sacred ' Indian culture ' and what is not. Retrograde Socio- cultural agendas are being shoved down the throats of the people under the auspices of the ruling dispensation. Economic development and that too in terms of GDP is not a solitary unitary factor which is the determinant of a nations progress. Economic development is always associated with social development, robust welfare schemes for the downtrodden, impetus on quality education and state of the art healthcare system, transparency in institutions, accountability, progressive and modernist attitude of the people,inculcation of a scientific temperament, separation of religion from politics and the cherished right of free speech, expression and artistic/ aesthetic freedom. Latin American countries like Uruguay, Argentina and Chile are far better than India in the parameter of HDI and social liberty. So by constantly exhorting for economic development on one hand and furthering regressive socio- cultural agendas, reducing social sector spendings and polarising the people on the basis of religion on the other hand which model does the BJP hopes to emulate. ? A Hindu Saudi Arabia maybe. ? Indian Exponent: Is BJP aiming for an economically developed yet socially regressive India?